Epic sword and sorcery adventure is on offer in Dungeons & Dragons Treasures of the Icewind Dale, the third video slot created by developer IGT in the Dungeons and Dragons franchise. The treasures on offer in this 5 reel, 30 payline game come via the Dynamic Stacks and free spins feature with added wilds. Start your quest from between 30p and £600 per spin. As you’d expect given the theme, the visuals in Dungeons & Dragons Treasures of the Icewind Dale have a strong comic book feel. Set against a snowy, forest backdrop, the reels include 5 different weapon symbols as well as a quartet of warrior characters – Drizzt, Wulfgar, Catti-brie and Bruenor. On each spin, 1 of the symbols will become a Dynamic Stack – this means it can land fully stacked on any of the 5 reels. Look out too for the extra-large character symbols which can land at random on any spin. The D&D logo is the wild, appearing on reels 2, 3, 4 and 5 only and replacing everything apart from the gold Bonus symbol. When the Bonus symbol hits on reels 2, 3 and 4 on the same spin, you’ll be awarded a payout of 3 times your total stake as well as triggering the Free Spins Bonus feature and with it 15 free spins. You’ll notice a series of meters below the reels during the feature – when the wild lands on reel 5, it will fill 1 of the meter positions next to a symbol. When all 3 meter positions are filled, the symbol next to it will become wild. This is in addition to the standard wild. It’s possible to turn multiple symbols wild here which can lead to some spectacular results. Land 3 Bonus symbols during the feature and another 15 free spins will be added to your tally – there’s up to 225 free spins to be won! 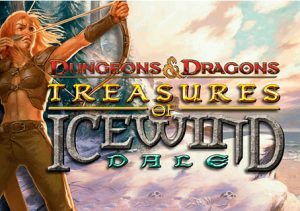 Dungeons and Dragons Treasures of the Icewind Dale is a fairly volatile offering – expect lean spells when your quest for treasure will come to very little. Trigger the free spins and combine multiple wilds with the Dynamic Stack symbols and some massive results are certainly possible. It may not be the best looking video slot you’ll see but Dungeons & Dragons Treasures of the Icewind Dale offers the chance to hit it big in the feature. If you have the bankroll to cope with the ups and downs, this is probably the pick of the Dungeons and Dragons themed video slots. If you like the fantasy theme, Microgaming’s Game of Thrones is recommended.